Judge Ina Kokhava of the Orša Court found Paulau guilty of disorderly conduct at polling station No. 16 where he was observing voting procedures on Election Day, September 11. The charge stemmed from a report by chair of the precinct election commission. According to Vital Paulau, he was avenged by the official for reporting procedural violations during the vote count, in particular, the commission members were seated in a way that prevented the observer from watching the ballot counting. 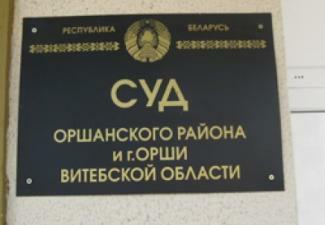 The observer was detained the following day, as he was leaving for Minsk. He was then charged with an administrative offense under Article 17.1 of the Administrative Code. During the court hearing, Paulau pleaded not guilty, but was eventually convicted on the basis of testimony from the election official and a witness, the official’s subordinate. The Judge ignored several procedural violations. In particular, the police report did not specify the place and time of the alleged offense, nor did it mention the names of the witnesses.